The workshop is for serious students who want to learn the basics of photography, using what they learn to produce a short portfolio. The studies are intense and hands-on. 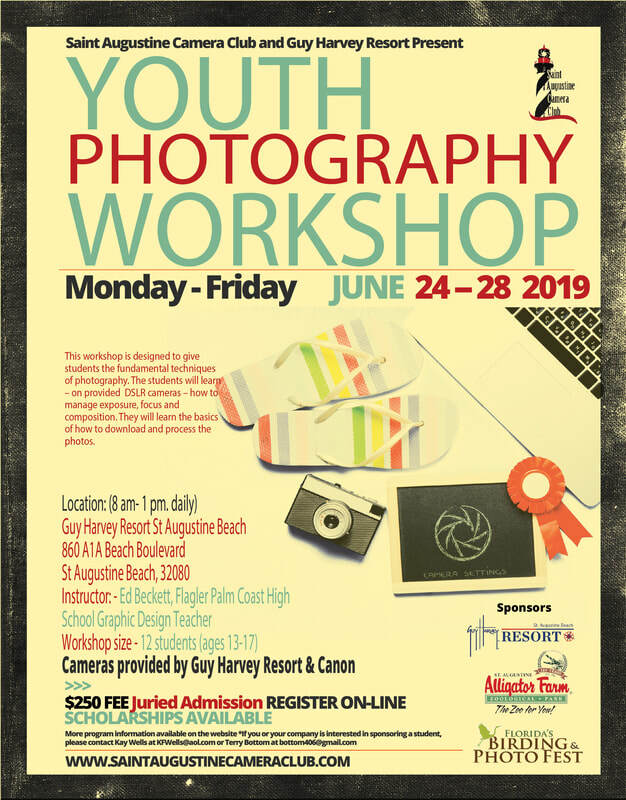 The best photograph of the week for each student will be displayed at an exhibit at Guy Harvey Resort during the summer months. Workshop admission is juried. To register a student, the fee should be submitted along with a three or four paragraph essay by the student on why they want to take the course. Photos and illustrative art may be included to bolster their essay. Registrants will be notified by May 20 if they are accepted. There are a couple of scholarships available. If the student is requesting one, that reasoning should be included in the essay. Canon provides loaner DSLR cameras and lenses for the students, who take them home to use for afternoon homework. Parents are asked to sign waivers to check out the cameras. Students must have access to a laptop to be used in class for post-processing sessions. Hours for morning classes are 8 am -- 1 pm. Water and snacks will be provided. Students will be outside for photo sessions to apply what they have learned in class. Weather permitting, a field trip to the Alligator Farm will be on the schedule. If applying for scholarship, no need to pay once form submitted. You will be notified if accepted. Cancellations after June 15 will be refunded 50% of class fee. Fees will be reimbursed if not accepted.